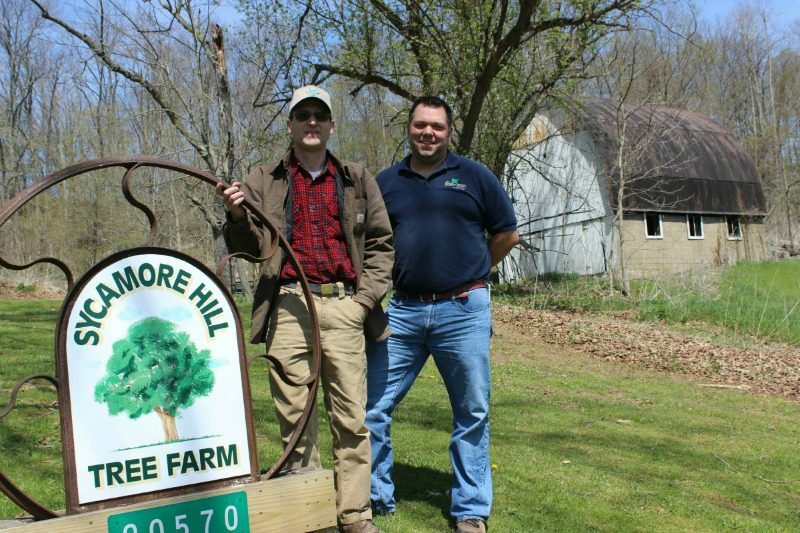 SCIO, Ohio — At the time he purchased the 150-acre property in Harrison County, Ohio, that would become Sycamore Hill Tree Farm, Alan Walter didn’t plan on becoming a tree farmer. His on-the-job education over the next 20 years would come with plenty of surprises. 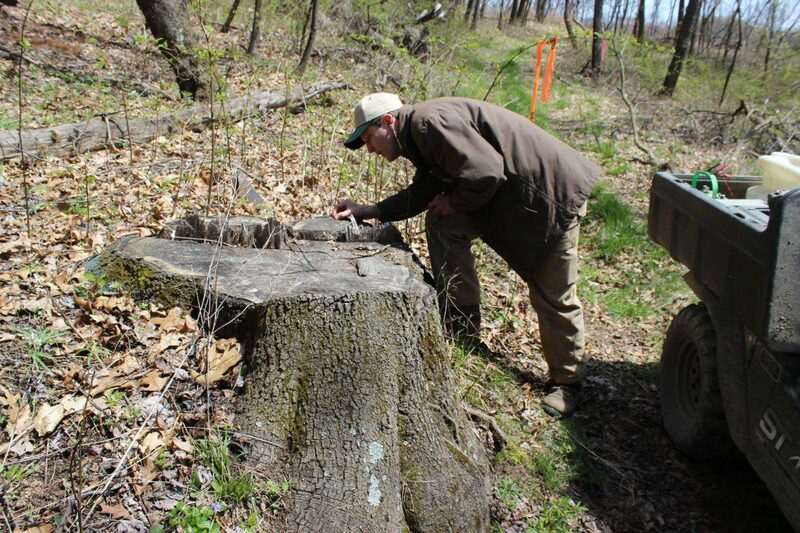 Randy Clum, the area’s Ohio Division of Forestry service forester at the time, visited the property and consulted Walter on what he had, as well as the work he had ahead of him. It would be 10 years before Walter cleared the property of the grapevines. Walter’s view of forest preservation, as it turned out, was also progressing. Multiflora rose is a perennial shrub with arching, prickly stems that climb over other plants and form dense thickets. An invasive plant from Asia, farmers began using it in the 1940s as natural fencing. Since Walter did not plan to farm his new property, the multiflora rose that covered his entire 150 acres was about as useful to him as an actual fence in the forest. Federal and state cost-sharing programs reimbursed Walter for both his time and the chemicals used to fight the multiflora rose. Yet it still took him another eight years to eradicate his property of the plant. Walter said guarding against invasive species remains one of his greatest challenges. All the while, Walter was attending numerous forestry classes and field days. Walter will host this year’s Ohio Tree Farm Tour at Sycamore Hill Tree Farm Sept. 19. Current ODNR Division of Forestry Eastern Ohio service forester, Jeremy Scherf, was named this year’s Tree Farm Inspector of the Year. Scherf said one of the most important parts of the tree farm program, and its recognition of a tree farmer of the year, is the opportunity for landowners like Walter to tell their story. “Most questions (have to do with) how to identify what trees they have, or just ‘I have this property, what should I do with it?,’” Scherf said. Scherf said there are 1,600 tree farms in Ohio, with 94 percent of land in the state privately owned. By 2013, the man who at one time could not see himself cutting down a single tree had organized his first tree harvest and was planning his first clear cut. Walter’s first harvest brought in $88,000. He was told by consultants that he could have made $250,000 if he had cleared the entire woods. Walter also recently clear cut just over 3 acres of black locust, a hard, rot-resistant variety with an exceptional regrowth rate. The clear cut garnered another $10,000. 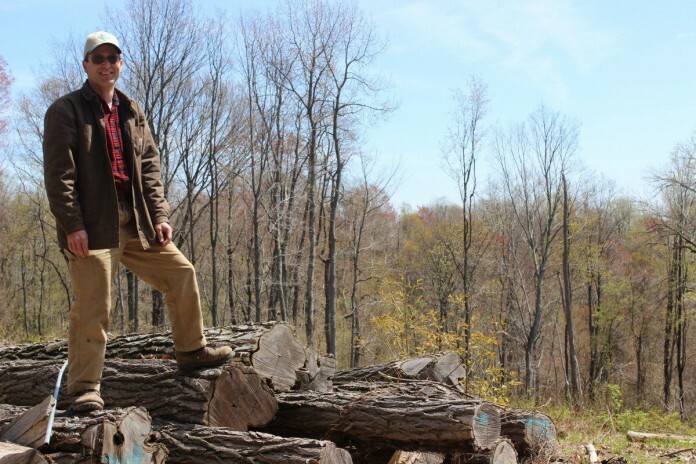 Black locust logs are valued as fence posts and hops field posts — a market he capitalized on by “just being in right place at right time with species,” he said. Walter said both his preservation efforts and his goals have changed over the years. That epiphany came with some surprising neighbors. Following the 2013 harvest, Chesapeake Energy negotiated with Walter to put in a 14-acre well pad on the property, taking 18 acres of trees in the process. But a new access road, which will make future harvests easier, along with various erosion-control measures, also came with the deal. In all, Walter said, the relationship with his new “neighbors” has been a positive one. Sycamore Hill Farm has a mix of red maple, ash, elm, and cherry in areas of former pasture land, all less than 70 years old by Walter’s estimation, and largely “reforested” by windblown or bird-deposited seed. The never-farmed area on north end of the property is home to hickory, white and black oak, chestnut oak trees in the 100-year-old range. Tree farming is far from a get-rich-quick venture. “It could be from $20 to 50 cents a board foot,” said service forester Jeremy Scherf said, with the average being about $750 an acre harvested. Requirements: In order to be considered for the program, a property owner needs 10 acres of woods, and the forest must be a certified. Certification: Certification includes inspection by a forester for erosion control and “special sites” of natural or historical significance, such as Indian caves, venal pools, and historical foundations; a commitment by the landowner to use the property for forest management purposes; and education in the proper use of herbicides. Recertification is required every five years. Payoff: Scherf said there is no cost to becoming a tree farmer, but there are forest maintenance expenses.